Something is clearly not right with Mr Freeze. He was really acting up before the race and once the gates opened, he ran for four furlongs and then tossed the bit…his rider did not abuse him and wrapped up on him at that point. The Super Screener top board hitter pick just crushed this field confirming her affinity for the off going and adding to her incredible string of on-board finishes, including 19 wins from 28 starts. 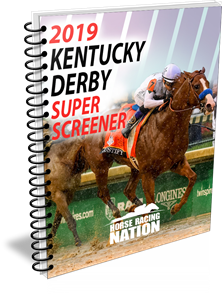 The top three ranked horses by the Super Screener comprised the Trifecta finishers. It can happen at this time of year…a deluge of rain hit the LA area, forcing the sealing of the main track and moving all but one of the turf races to the main track. The 9-horse field scheduled to go was reduced to a meager four rivals and all bets were off. The Super Screener top win pick fired again as the odds-on favorite, easily disposing of this field. This was shaping up to be a great betting race with a full field of higher priced claimers going down the hill at Santa Anita. Instead, rain forced this race to the sloppy, sealed main track and our top three ranked horses were scratched as a result. Our next top ranked horses performed well and our stand-against-favorite pick, Tough But Nice. ended up finishing last at 7-2. Now the stakes action really starts picking up this weekend with the Sunshine Millions festival taking center stage at Gulfstream Park. In addition, the Derby trail resumes with the always interesting G3 Lecomte run at Fair Grounds and Tampa Bay’s local prep, the Pasco Stakes, will be in play as well. Plenty of great races to choose from. Until Saturday, Go Fast and Win! ← Previous Story Springboard Mile Weekend RECAP!